To squeeze every last ounce of fun out of the trail, you need a bike that can take a hit and dish it right back out ten-fold. 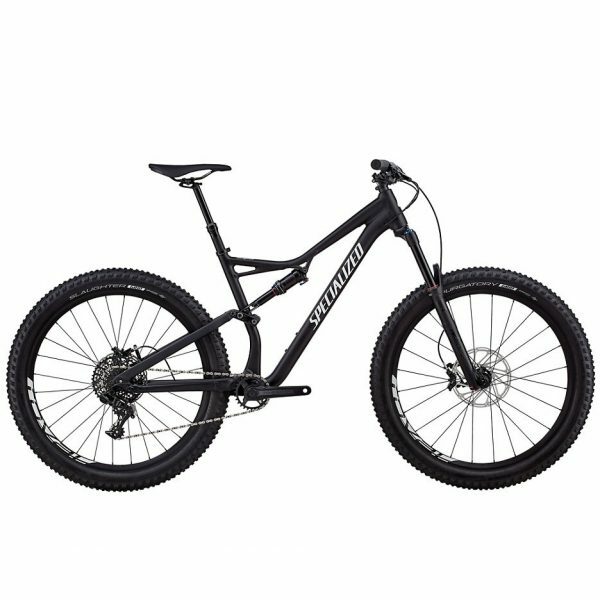 In other words, you need the Stumpjumper Comp Alloy 6Fattie/29. Sure, it features an M5 alloy construction that’s lightweight and durable, but what we’re most excited about is its 6Fattie Wheel/Tire System. It takes 27.5 wheels and wraps them in 3.0″ tires in order to achieve crazy new levels of traction, control, and floatation that’ll shake your idea of trail riding to the core. This system also allows you the opportunity to toggle between 29-inch wheels (not included) and 6Fattie wheels, allowing the ultimate in configuration options for the trail at hand. And when you combine all of this with a mix of SRAM’s most durable components and our 6Fattie Trail Geometry that maintains a roomy top tube, ultra-short chainstays, and a slacked out front end, you’re looking at the future of trail bikes. Finance this bike for as low as $80 per month. See store for details. – M5 alloy Trail Chassis with Stumpjumper FSR rear end blends durability, stiffness, and light weight, while 135mm of travel Trail Geometry provide more than capable handling. – A RockShox Reba RL fork handles suspension up front with ease, soaking up bumpy terrain with 150mm of plush travel. – SRAM’s 11-speed GX groupset features a wide gear range that delivers climbing and descending efficiency in spades. On top of this, the one-by setup is notorious for being next to impossible to drop a chain with, plus it provides a significant weight savings in comparison to a standard two-by setup.